Address: 692710 Primorsky Kray, Khasansky r-n, st. Primorskaya. 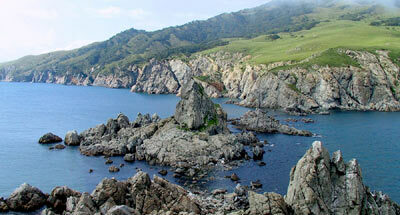 Zapovednik Kedrovaya Pad, on the southern outskirts of Primorsky Krai, was founded in 1925. Its area is 17,9 thousand ha. It is located on the western coast of Amursky Bay in the basin of the river Kedrovaya on the slopes of Cherniye Mountains. 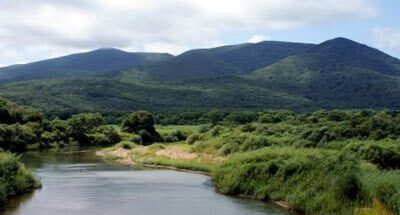 From the main part of the Japanese Sea it is separated by a flat marshy valley 2-3 km wide. The relief is low-mountainous: average heights are 300-400 m above sea level; maximum heights 700-800 m above sea level. 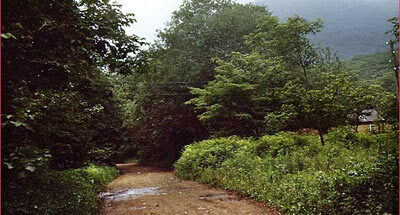 More than 70% of the territory is covered with forest — coniferous broad-leaved and broad-leaved. More than 10% of the Zapovednik’s territory is occupied by fir forests of rich range of species and complex structure (needle fir, Quercus mongolica, ash, maple, birch, Japanese yew, and Kalopanax septemlobus). Primary black-fir forests and small areas of silver fir broad-leaved forests remain, formed of Khingam fir, Picea ajanensis, and some Korean pine. In the place of coniferous broad-leaved forests secondary broad-leaved forests have come: oak woods and lime-ash forests. Among oak forests (about 50% of the Zapovednik's territory) forests of Quercus mongolica with elements of several species of birch, lime, and maple prevail. In the valleys mixed forests with a great natural diversity of trees, bushes, and creepers are spread. Flora constitutes more than 850 vascular plant species, including 17 rare ones included in the Red Data Book of the Russian Federation (among which Japanese yew, Kalopanax septemlobus, Betula schmidtii, Oplopanax elatus, and Chinese ginseng) and 40 species rare in Primorsky Krai (Pyrus ussuriensis, Actinidia arguta, Actinidia kolomikta, Schisandra chinensis, Cerasus sachalinensis, etc.). In the fauna several species of common shrew are present, including endemic giant shrew; mole is characteristic. In the Zapovednik there live Siberian roe, sika deer, Siberian weasel. Indian marten, badger, raccoon dog and fox. The number of otter is high. Birds account for more than 200 species, including many endemic to the Far East. Among reptiles Rhabdophis tigrina and Elaphe rufodorsata are characteristic. Among rare and disappearing vertebrate animals there are: Murina aurata, leopard, Felis Euptilura, Butastor indicus, and Accipiter soloensis. Kedrovaya Pad is the only Zapovednik of the District where the leopard lives permanently. Of rare insects the greatest interest is presented by the relict cockroach.